This trading strategy is a semi day trading - swing trading strategy with the ability to let your positions run for 2-3 days capturing a big chunk of bullish runs. There are two possibilities, you can enter the stock and then exit it later in the day or you can enter it and exit the stock a few days later. It all depends on how fast the stock runs up. This trading strategy can also help you to capture a very big risk reward ratio if it works. The reason why I call this trading strategy 5MD200 is because we will be utilizing the 200 day moving average and the intraday 5 min chart. The D200 stands for the daily 200 MA while the 5M stands for the 5 min chart. For those who have been trading for a long time, you will already know immediately why I attach such an important weight to the 200 day moving average. The 200 MA is watched by many many professional traders and fund managers. Which is why a stock can often bounce off the 200 MA and continue to move higher. As you go through many many charts, you will see that a lot of stocks will find support at the 200 MA. Let us take a look at some charts below and you will understand the power of the 200 day moving average. The chart above is the daily chart of MOH. 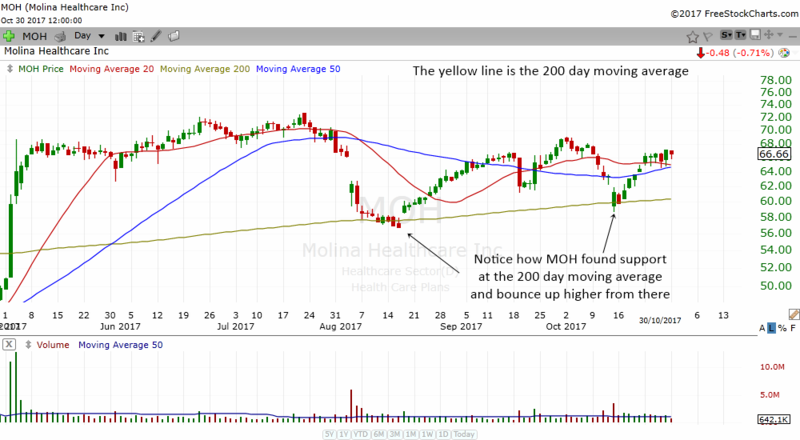 The yellow line on the chart is the 200 day moving average of this stock. The blue line is the 50 MA and the red is 20 MA. I like to use these 3 moving averages so I usually have them on the charts. Notice how MOH had many ups and downs. Whenever the stock meets the 200 day moving average, it stops dropping and bounces up. If you were to enter the stock during those times, you would have had a very nice trade. Which is why we should always be on the lookout for stocks that are correcting to the 200 MA. Later I will show you how to enter the stock using the 5 min chart. The chart above is the daily chart of Apple. Apple which is one of the most famous and closely watch stocks in the world also found support at its 200 day moving average. There are 2 times that Apple bounced off the 200 MA on this chart. One was in Sept 2016 and the other was in Nov 2016. 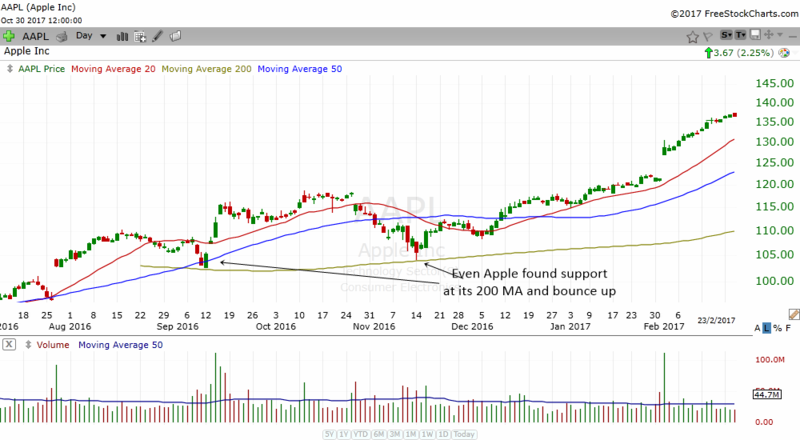 If you have paid attention to Apple when it met the 200 day moving average, you could have bought the stock for a nice trade. One thing you need to remember about the 200 day moving average is that the stock need not touch the moving average. All you need is that the stock must trade very very near the 200 day moving average. Some stocks will come very near to the 200 MA and the psychological impact is enough to make the stock bounce back up. At other times, the stock may trade slightly below the 200 day moving average and then bounce back up furiously. It takes some experience and judgment on the part of the trader to make use of the 200 MA. There is no rule set in stone for the usage of the 200 MA. Now that I have shown you the power of the 200 day moving average, the next thing I would like to show you is how to enter this trading strategy. You must realize that this trading strategy is not for the faint of heart. This trading strategy can be considered an aggressive trading strategy because we are trying to catch the stock at the earliest turning point. Therefore, you have to expect to be stopped out quite often. However, the risk reward ratio of this strategy is good enough to be worth the risk. If you risk $1000, you can expect to make $2000 or even $3000 or more. So the risk reward ratio can be anywhere between 1:2 to 1:3. As you will remember, the daily 200 MA will be our focus point. Therefore, the trader who wants to employ this trading strategy will scroll through charts and look for stocks that are about to hit the 200 day moving average. When a stock is correcting near to its 200 MA, you put it into a watchlist and look at it every day. Which is why it is always important to have a watchlist. Professional traders and experienced traders will always have a watchlist. They are a list of stocks that they will look at everyday to get ready to enter the stock for a trade. 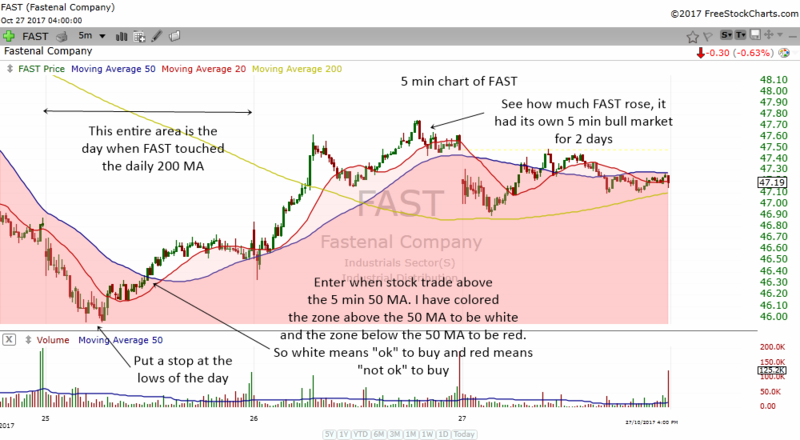 The chart above is the daily chart of FAST. Let's say you had it in the watchlist because you saw it correcting to the 200 MA. See how FAST dropped to the 200 MA. There was also price support there. 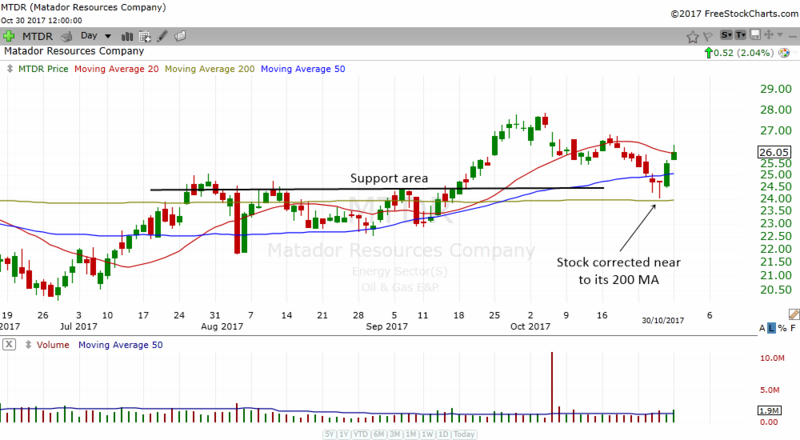 So when there is a 200 MA support and price support, the combination can be very powerful to give us a good trading candidate. Now that we have found a trading candidate in FAST, we will switch to the lower timeframe and monitor it very very closely. In a way we are actually doing a little bit of Multiple Time Frame Analysis. Multiple time frame analysis is combining a few time frames to analyze a stock. Experienced traders use different time frames to find trading candidates and hone their entries. At this moment, let me introduce you to the 5 min 50 MA. The 5 min moving average is just a simple moving average that helps us know when it is conducive to buy the stock. From experience, I have noticed that stocks tend to do well intraday when they are above their 5 min 50 MA. Many traders use some type of moving average in the intraday charts to filter when to buy stocks or sell stocks. I like to use the 5 min moving average. When the stock is touching the daily 200 MA, we quickly switch down to the 5 min intraday charts and wait for it to trade above the 5 min 50 MA. The moment the stock trades above the 5 min 50 MA, we enter the stock. Always remember that this is an aggressive trade. However, we are taking a calculated risk. We do not simply enter the stock the moment it touches the daily 200 MA. We set a filter using the 5 min 50 MA and only enter when the stock trades above the 5 min 50 MA. The chart above is the 5 min chart of the same stock FAST. Notice the entire 25th is actually the day that the stock touches the daily 200 MA. In the early part of the trading day, the stock is actually still declining. Then the stock formed a 5 min double bottom and traded above the 5 min 20 MA (the red line). The stock eventually traded above the 5 min 50 MA (the blue line) and that is when we enter the stock for the 5MD200 trading strategy. In this case, the entry price is around $46.40. To make it easy for us to see the entry place, I colored the area below the 5 min 50 MA as a red zone. This red color warns us that the stock is not yet ripe to enter. The moment it goes into the white zone, it tells us that it is alright to enter this stock. You need to have an insurance in case the trade does not work out. That is why you need to learn where to put the stop loss. It is very easy. Just put the stop loss at the low of the day. The day which the stock touches the daily 200 MA, that is where you put the stop loss. Just put it below the lows of the day. In the case of FAST above, the stop loss would be around $46.00. Taking the entry point as $46.40 and the stop loss at $46.00, the risk you take is $0.40. You can opt to put the stop loss 0.05 or 0.10 lower which will be around $45.90 if you want. This helps to prevent whipsaws but normally I find that if the stock trades back above the 5 min 50 MA, they will usually go up. If not just take the stop loss and move on to the next trading candidate. I have said before that this trading strategy is a semi day trading-swing trading strategy. What this means is you can close out the position at the end of the day and still make money or you can opt to close out the position after holding it for a few days. If you choose to hold it for a few days, there is a possibility of you reaping a bigger reward. On the other hand, you might be exposed to overnight risks such as a gap down. But do remember, that the 200 MA is a powerful support. So if the pattern works, you might be seeing a rise for a few days and sometimes even a few weeks. Since you are getting in at an intraday area, which is almost at the low, you stand to reap a very huge reward if the pattern works. I do not recommend that you judge the performance of this trading strategy only by a few trades. You need to consistently trade this pattern and only judge the performance of this trading strategy after at least 10 trades. It will be better even to judge it after 30 trades. That way you will let the results smooth itself and see the benefits of some super winners covering the frequent losses that you will face. The above is just some ways in which you can take profits. As you play this trading strategy more and more, you will notice other ways to take profits. Heavy resistance areas are a good place to take profits. 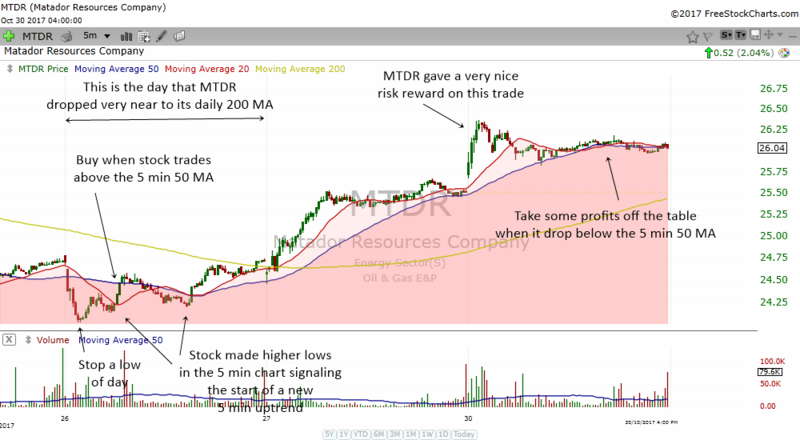 The chart above is the daily chart of MTDR. Notice how the stock had a correction in October 2017. The stock corrected to the price support area and it also drop very near to the 200 day moving average. Although the stock did not touch the 200 MA, it came very very close to the 200 MA. That is good enough for us to start monitoring the stock and put it into our watchlist. I think you would have notice that MTDR formed a bottoming tail near the 200 MA. Some traders are trained to find bottoming tails and they will enter the next day when the stock trades above the highs of the bottoming tail. We on the other hand, using the 5MD200 Bullish Trading Strategy will be entering on the day of the bottoming tail. In other words we are actually going in as the bottoming tail is forming. This is a very early entry compared to other trades. Which is why when it works, we stand to gain a big risk reward. So, we have spotted a trading candidate in MTDR. The next thing we do is we will switch to the 5 min chart of MTDR. Notice the 26th is the day of the bottoming tail and also the day that we will enter the stock. Early in the morning, the stock dropped. As the day progressed, it formed a higher low and then traded back above the 5 min 50 MA. That is when we enter the stock. Notice how easy it is to spot the entry point when we color the chart as red zone and white zone? The moment the stock trades into the white zone area, that is the entry point for this trading strategy. We put a stop loss at the low of the day and wait for the trading strategy to work in our favor. Throughout the day, the stock corrected a bit after we enter. This might scare many traders but since it did not hit the stop loss, the trade is still in play. The correction only manage to form another higher low and this is a good news to traders. The higher lows, set up the stock to enter into a 5 min uptrend. In this case, if you have closed out the position at the end of the day, you would probably have made a small profit. But if the trader holds the stock for another 2 days, the trading strategy did its work and gave traders an extremely nice ride up. The trade resulted in a very good risk reward trade. You have now learned an aggressive trading strategy that takes advantage of the 200 day moving average as well as the 5 min 50 MA. You have also learned how to analyze stocks using multiple time frame analysis. The combination of different time frames can often give us a winning trade. Study this trading strategy well. 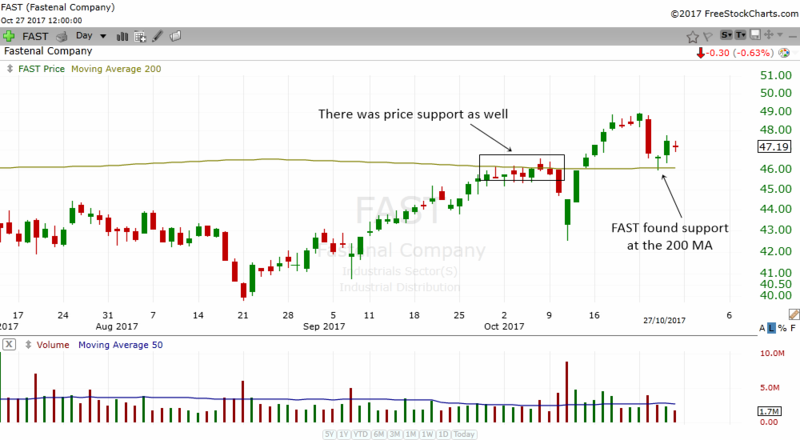 Look for past examples as you scroll through different stock charts and annotate them with your own thoughts and notes. You may find that this trading strategy works well for you and help to bring bread on your table day in day out.